As 2014 comes to a close, I’ve got part six of our Pure Chocolate Wisdom series, sponsored by Pascha Chocolate. 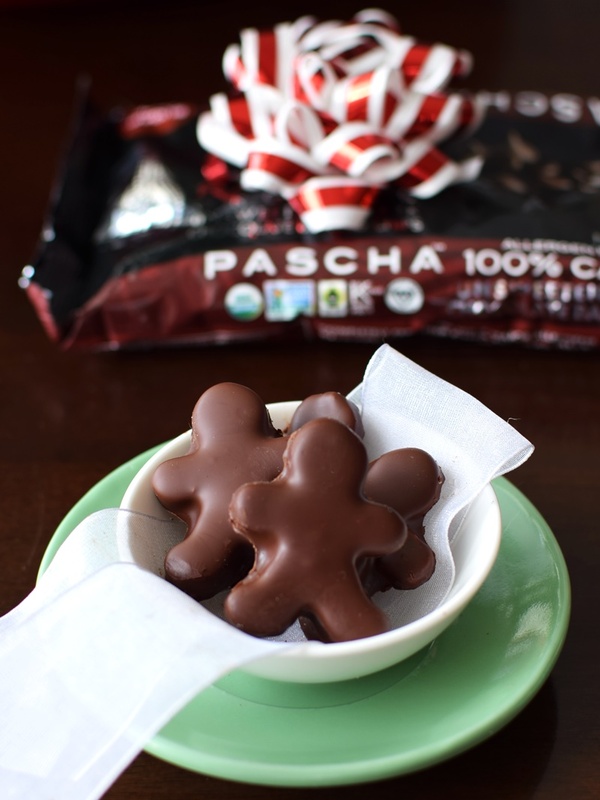 I hand-picked Pascha Chocolate for Go Dairy Free, as it is made in a top allergen-free facility (dairy-free, nut-free, gluten-free, and even soy-free! ), and is certified organic, vegan, fair trade, kosher, and non-GMO verified. They even offer 100% cacao chocolate chips that are suitable for paleo diets. For the yearly wrap-up, I used wisdom from the prior posts in this series to create something simple, but amazing: all-natural, vegan, egg-free, gluten-free, soy-free, nut-free and dairy-free peppermint patties! 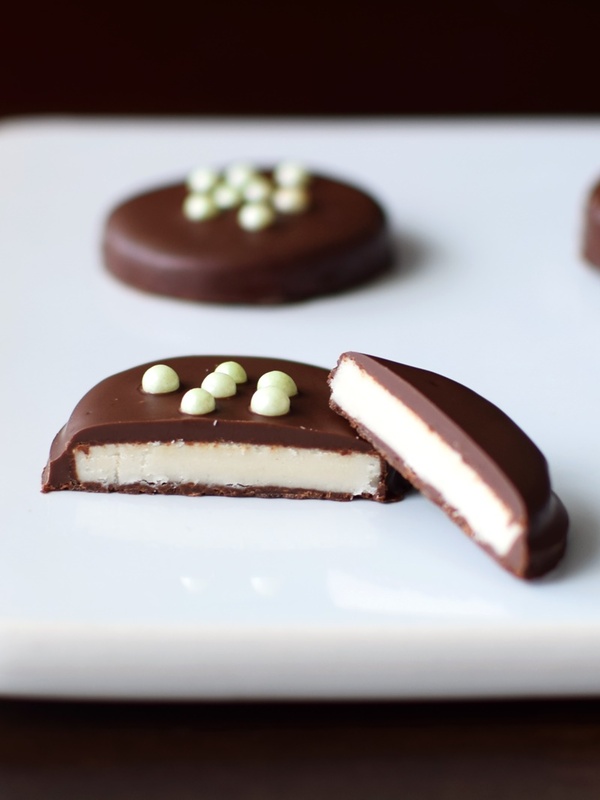 Dairy-free peppermint patties are so fun to make. The filling dough comes together in minutes, and is easy to roll and cut, just like sugar cookies! And then the dipping begins! My favorite technique for melting chocolate is easy, quick, and pretty much foolproof, plus it gives you the freedom to take your time as you dunk each slice. Oops, one got away! No worries – it’s okay if he just needs some time to chill alone. 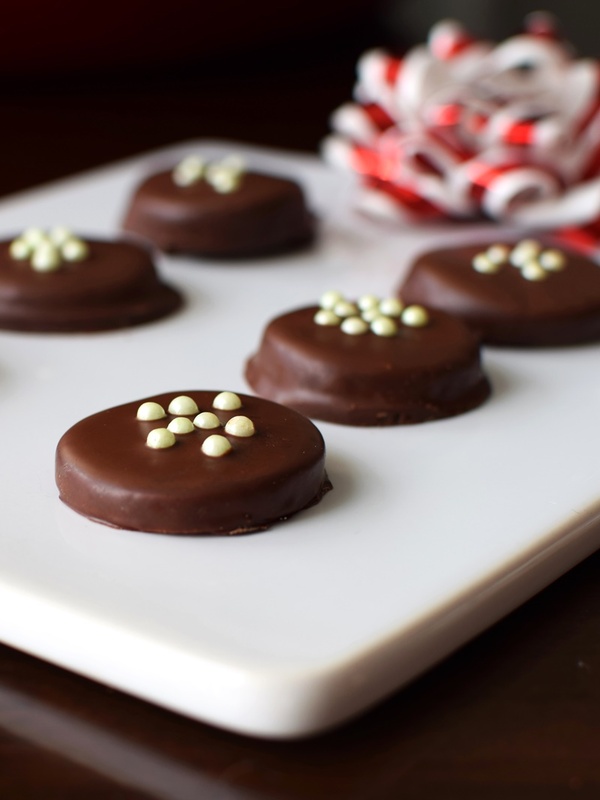 These homemade dairy-free peppermint patties taste even better when made a day ahead – allowing the peppermint flavor time to mellow and meld. By ingredients, this recipe is dairy-free / non-dairy, egg-free, gluten-free, grain-free, nut-free, peanut-free, soy-free, vegan / plant-based, and vegetarian. 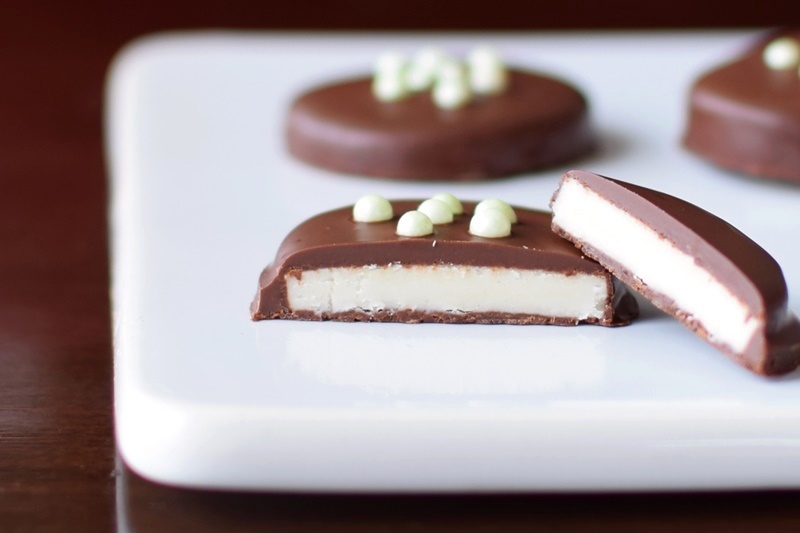 Just be sure to use brands and ingredient options in these dairy-free peppermint patties that suit your dietary needs. Chocolate: I use Pascha Chocolate because it is dairy-free, soy-free, certified gluten-free, certified vegan, and made in a facility free of the top allergens. Since they offer so many percentages (chips in 55%, 85%, or 100% and bars in 55%, 60% w/ Maca, 70%, or 85%), you can opt for an outer coating that’s milky, semi-sweet, dark, or unsweetened for contrast. Oil / Shortening: I used Nutiva Superfood Shortening, but their coconut oil will also work quite well. 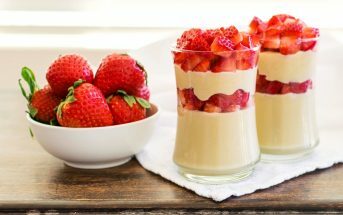 Coconut Cream: I used the thick cream from So Delicious Culinary Coconut Milk. If you have nut allergy concerns, see this post: Are coconut-based foods safe for tree nut allergies? 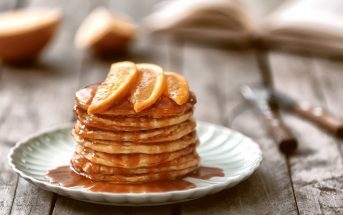 Powdered Sugar: I use organic powdered sugar for environmental reasons, but it is also a great option if you are strictly vegan or avoiding corn (most organic brands are not cut with cornstarch). Pure Extracts: I actually used Simply Organic peppermint oil, but an alcohol-free extract would also work well. Just make sure you go pure, rather than artificial, with both the peppermint and vanilla for the best taste. I prefer alcohol-free since this is a no bake recipe. 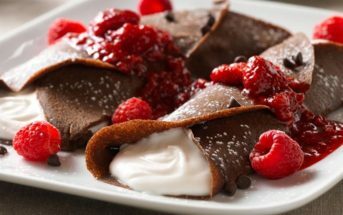 I am sharing this recipe on Gluten-Free Wednesdays at Gluten Free Easily and Allergy-Free Wednesdays at Whole New Mom! Sift the powdered sugar into a mixing bowl. Add 2 tablespoons coconut oil or shortening, the coconut cream, and the extracts. Stir by hand or with a mixer on low until thoroughly combined. It may form crumbs rather than a smooth dough - that is fine. Bring the mixture together with your hands, which will help to warm it just enough, kneading a few times until you get a relatively smooth dough. Now you can a) roll the dough into a log that is about 1½ inches in diameter or b) roll the dough out onto wax or parchment paper to about ¼ inch thickness. 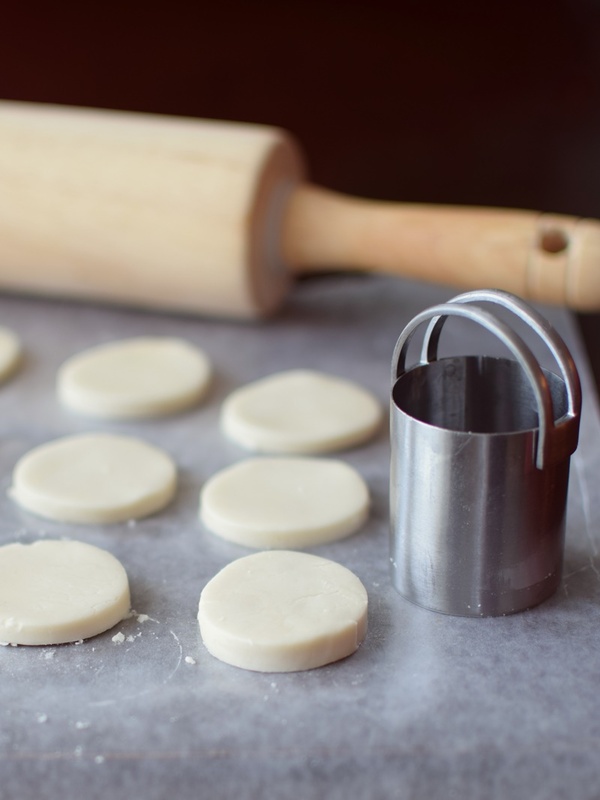 I like option b - cut the rolled dough with small round cookie cutters or desired shapes (the dough is a little fragile, so nothing too intricate), as you would with sugar cookies. Place the log or cut dough into your refrigerator and let chill for about 30 to 60 minutes. If using the log method, remove the log from the fridge, and slice into ¼ inch circles. In a medium-sized bowl, melt the chocolate with the remaining 1 tablespoon coconut oil or shortening. If melting the chocolate via the microwave or stove top, let it cool for a few minutes before proceeding. 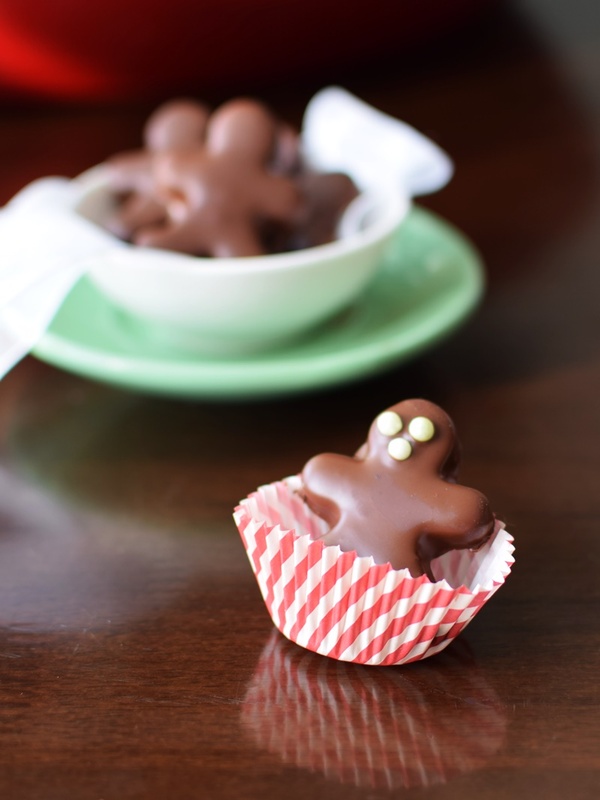 One at a time, dunk the filling rounds or shapes in the chocolate, carefully remove, letting residual chocolate drip off, and place on wax paper, parchment paper, or a silicone baking mat. If using sprinkles or crushed candy canes, top the chocolates now, while still wet. Let the candies set up at room temperature (can take several hours, depending on how warm your home is), or cheat a little and chill in the refrigerator until set. Once set, store in an airtight container at room temperature for a few days, or chilled for longer. Shortening Note: I prefer using an organic shortening in this recipe for best taste and consistency (such as Nutiva or Spectrum), but you can sub a buttery spread or you can sub coconut butter in the patty center (2 tablespoons) and coconut oil (1 tablespoon) in the chocolate. Coconut oil can work in the patty center, but is a little more finicky and will melt more readily with warm chocolate. Coconut Cream Note: You can buy it at the store in cans, but you can alternatively let full-fat coconut milk (sold in cans or small 11-ounce cartons) settle (in the refrigerator, if needed), and skim coconut cream from the top to use in this recipe. I used So Delicious Original Culinary Coconut Milk and skimmed the cream (keep the rest to use in other recipes!). I made these exactly as directed, using Spectrum shortening and they turned out perfect! The filling was really easy to work with. They tasted better than York! Thank you! So glad they worked out well for you Mindy! I had the same question about the use of sugar. What happens with just using stevia? By stevia-blend do you mean a blend of stevia and sugar? How about brown sugar and stevia? They have “stevia baking blends” which have bulk fillers added so that you can use it as a 1:1 ratio for sugar. I don’t recommend it, but you can try! Another option is powdering coconut and then sweetening w/ stevia to taste. I haven’t tested though! Ok. I may try the stevia blend or just wait until I can actually eat sugar again. I think the coconut flake-stevia option may alter the taste. You’re welcome – I hope it works out for you! Feel free to share if you do find a good option. Funny thing is, I am allergic to cane sugar. How much stevia would I use plus what else could i use to balance out the sheer bulk of the amount of powdered sugar added? You would need to use a stevia blend or other sugar alternative in an equivalent amount for the recipe to work. Just using straight stevia wouldn’t give the right consistency. In the peppermint patties is there a suggestion for the coconut cream? I am allergic to coconut as well as dairy. Hi Susan, You mainly just need a little liquid. You can up the shortening slightly, like to 3 tablespoons in the filling, and then add milk alternative (your choice of type), as needed. It will probably be around 1 tablespoon, but may be a little more or less. 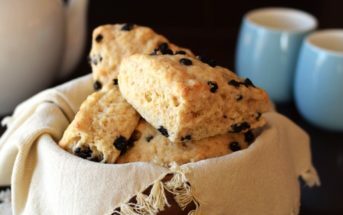 You want the filling to be crumbly when just mixed, but able to come together with your hands into a smooth, kneadable dough that can be rolled. I adore all things peppermint and these look amazing! Maybe I’ll make some tonight!! Just wondering if you have a nutritional guide with these mint patties. I have to substitute all my sugars (Candida) but I’m curious to know what this original recipe holds for carbs and sugar content. You can look up and calculate nutrition info via sources on the web. That said, if you are looking to cut all sugars for Candida, this is not the recipe for you. Thanks Alisa, I did add more cream and still had problems. I was able to get some patties out of it then stuck the rest of the dough in the fridge overnight. I don’t know if I just needed a break from it cause I was losing my patience, but I went back to it today, stuck it in the microwave to soften like 20 min and low and behold I was able to finish it up and it rolled much easier. Can’t wait to try. I tried making these today and it would not form a dough. I measured it exactly as the recipe stated but all I get are crumbs. Any suggestions? Hi Annalise, yes, when you blend it, it forms crumbs. As per the instructions, you need to bring it together into a dough with your hands. It comes together! If it is still too crumbly, add just a bit more coconut cream (1 teaspoon at a time) until it comes together. You are working it with your hands though – don’t stop with a mixer or spoon! looks delicious.. All I have is coconut milk… I will have to get other ingredients.. I can’t wait!!!! I know what I’m baking for Santa now. Thanks for the great idea.